On the first day of school, Mr. Joel Williams poses with his children Jonah and Julia before heading to Whitney High School. Photo courtesy of Julia Williams. 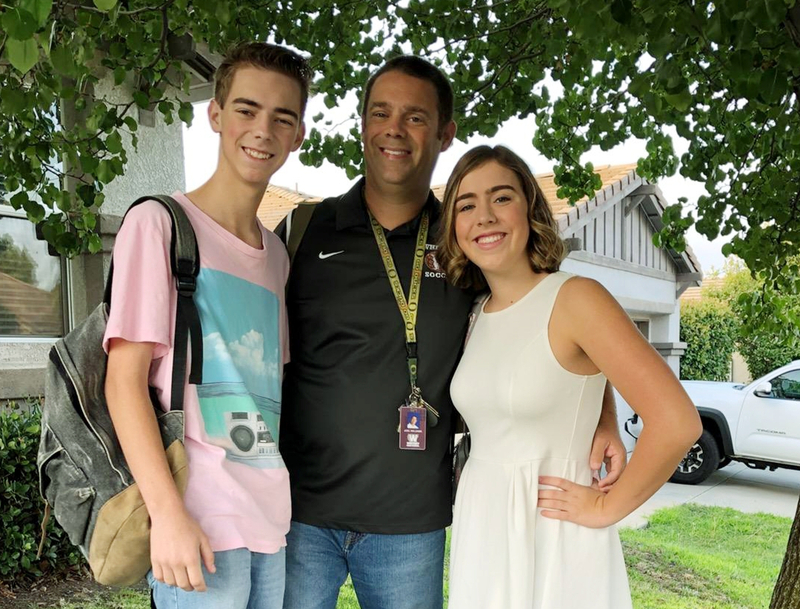 Between Mr. Joel Williams’ math classes and soccer program, Jonah Williams’ ASB responsibilities and Julia Williams’ swim and broadcast schedules, their family life seems to revolve around Whitney High School. Siblings attend school together, but the Williams have a unique perspective, with 2 students and a teacher all in the same family and educational space. “I’m in his classroom a lot. I like to leave some of my backpacks in there, some of my snacks in there … A lot of the time, if I’m going to be late to a class, … he’ll tell my teacher so I don’t get a tardy,” Julia said. For Mr. Joel Williams, an employee since the opening of the school, having his kids in the workplace has turned out well. “It’s amazing. It’s really sweet. I like it when they pop in … On days that are less busy, less stressful, it’s fun to be able to see and hear what’s going on in their lives, what happened in this class or this friend or whatnot,” Joel said. However, he realizes that their family time may not always push his kids to diversify their interests. “You may want to have a life that is slightly different from your family, so know[ing] that I am always kind of in the background somewhere can be hard on them as well,” Joel said. Plus, with the speed that class gossip or rumors about teachers spread, Mr. Joel Williams worries about the effect it has on his own kids. “The hard part for them is that they might hear things from a student who is upset, for them not to personalize it, and realize that every kid is going to have positive or negative feelings towards a teacher. Not everybody is going to enjoy everybody, for my kids to [not] take it personally, it’s just part of the dynamics of what they have to deal with,” Mr. Joel Williams said. In Jonah’s experience, others usually seem to see more disadvantages in his life than he does. “You can’t get away with a lot of things, which I guess you could consider a disadvantage, nor would I really try to do things… A lot of people have asked me ‘is your father a helicopter parent, is that why you’re going to this school?’… No, but I know that is a downside to many students. They don’t like the idea of their parent always being with them,” Jonah said. For Julia, the primary problem with being a member of a prominent family on campus is treatment from teachers. “Some of them are extra harsh on me because they know that my dad would be okay with it, but quite a few of them tend to treat me like I’m like royalty or something … Especially substitutes, because a lot of them either know my dad super well, or they are his old students, so they tend to make a big thing about it. They’re like ‘oh you’re Williams daughter!’ ….Then, sometimes, they just spend the entire class period talking to me all about my father, so I’m left like ‘okay, thank you, but I need to get my work done’,” Julia said. However, the bonds made through her family connections have been positive towards Julia’s school life. “In my freshman year, I completely skipped an entire question on a math test, and I came back [to classroom E3] after, looking for my dad. Since [my] teacher knew me so well, they let me quickly do that question because they knew I had just forgotten to do it …. Which I know made a lot of people angry because they had also skipped the question but they didn’t get the opportunity to make it up, ” Julia said. Jonah, a senior, has been a student in 3 separate classes that Mr. Williams taught: Integrated Math I as a freshman, honors precalculus as a junior, and a morning TA period this year (to which Jonah hinted as to having lax attendance rules). “My freshman year experience was pretty good, just because Integrated 1, there wasn’t really any hardship in the class at all, but precalculus was different. The first C I ever got on a transcript was in his class, so that was talked about, whereas if he wasn’t my teacher, it would have been different…” Jonah said. Overall, the advantages of being with family at school seem to outweigh the disadvantages, at least for the Williams. “It’s really special to have him working at school. It has a lot of advantages… especially when he’s my teacher or helping me with … schoolwork or teaching me study habits that he used,” Jonah said.